I have lights specially fitted to the bed up front, so it can easily be converted to a cold frame. I’ve successfully grown lettuce in it in April. Now I was thinking of growing something there from November to March, the coldest months. A, the owner of the horse stable, uses our property to get to conservation land where she can ride. In return I can go and get as much manure as I want. The stable is about a quarter mile away, and I do the entire trip in twenty minutes, if I’m not held up chatting with A or the neighbors. Fortunately it’s downhill from my house, so I get there real fast. Unfortunately it’s also (go figure) uphill to my house, and that makes for a great work out. I sort of, to the best of my abilities, followed these instructions. The bed is 3.5 – 7 feet, but I started with a little less than half of it, as I had only the one 6 cu.f. wheelbarrow of manure. The instructions call for a drainage pit with gravel or cinders, but by the time I dug 14″ deep (from the soil line), I hit rock bottom. There I used my fork to open up the stony soil a bit. 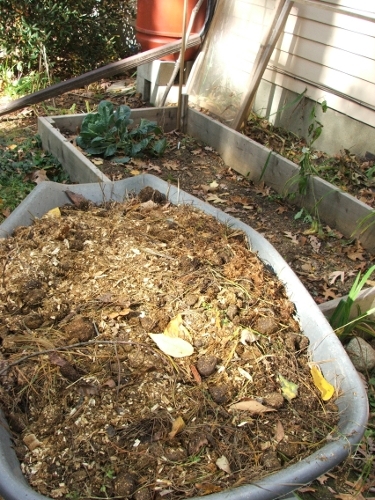 Then I added 10″ of horse manure. It turned out to be exactly the entire wheelbarrow, though I’m sure it’s going to compact quite a bit, that stuff is so fluffy with all the woodshavings, hay and straw in it. I made it all sopping wet. 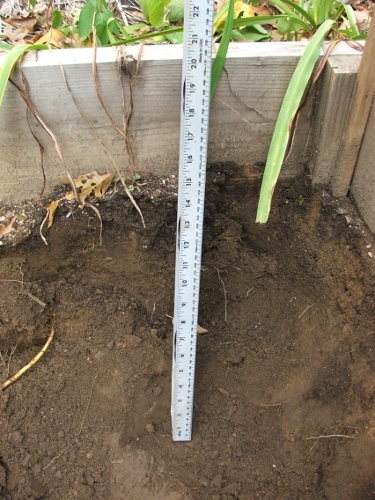 Then I added 4″ of the original soil and put on the lights. Now I need to monitor the temperature of the manure. 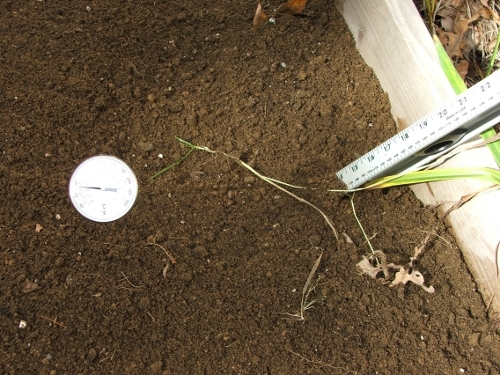 At the moment it is 70 F (by comparison, the soil in my hoop house beds is at 76 F). I expect it will start heating up soon. As soon as it drops back down to 75 degrees, and stays there, I can put in the spinach and lettuce seedlings. I’m going to get a lot more of that manure. Perhaps I’ll convert the entire bed to a hot box. But I definitely want to use it to dress the other beds that I won’t use over the winter, then to tuck them all in with blankets of cardboard and straw. I like the synergistic straw culture that Emilia Hazelip promotes in the video I posted earlier. Not to touch the soil at all, just to keep adding, adding… I’d like to play around with that in my own setting. 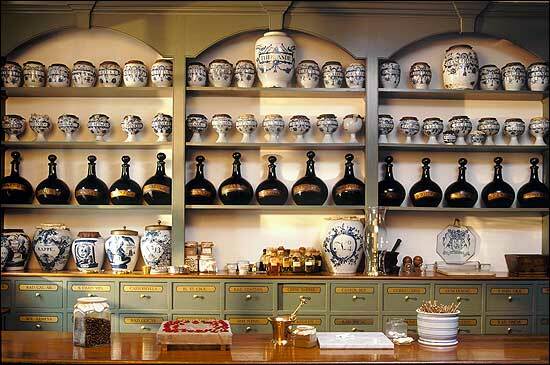 Wow, as I’m reading it’s occurring to me that I can do this too, with llama manure! 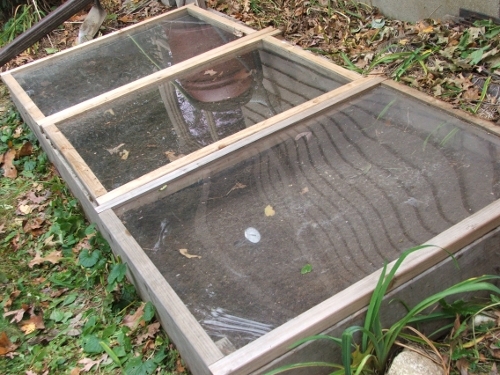 DH and I have talked about making cold frames for the spring, but winter hot boxes would be even better.